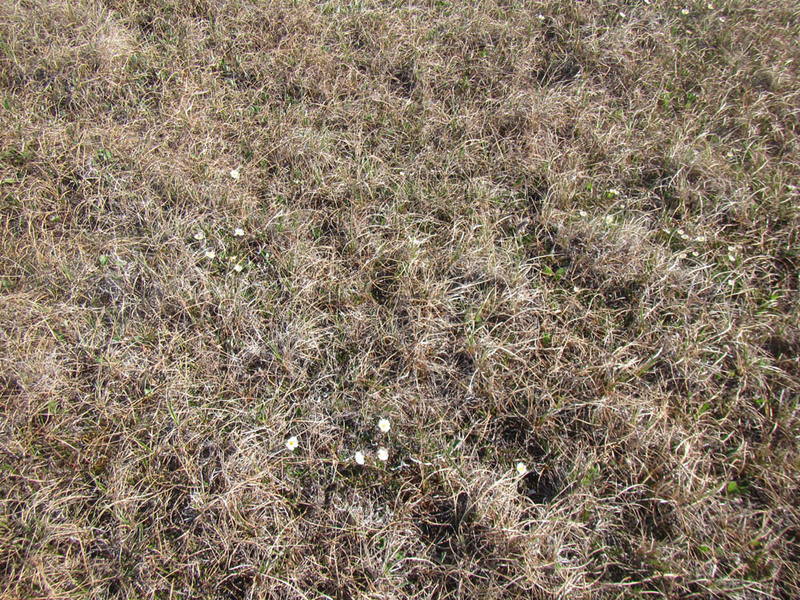 We always expect some wintry weather in early June in the Arctic. This year has been exceptional. 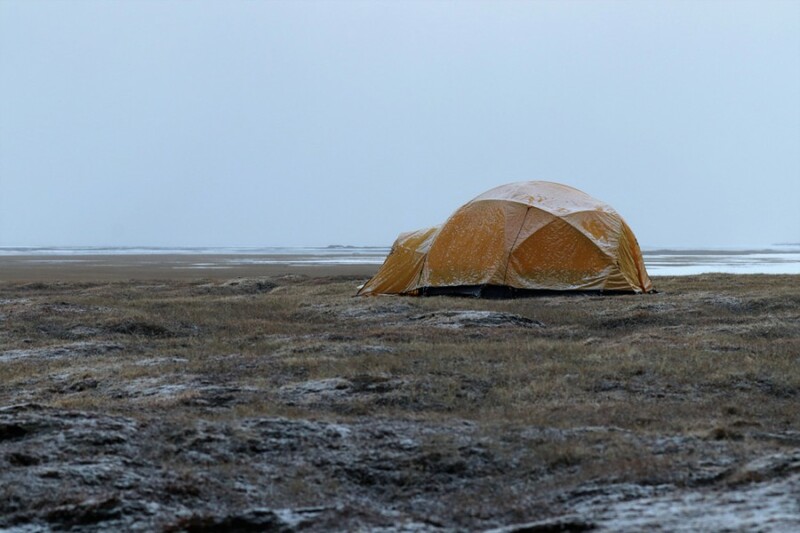 After two glorious sunny days when we flew in and set up camp (though with temps in the 30s), we have had 12 days of mostly sub-freezing temperatures, howling winds gusting over 30 MPH at times, and many overcast days with bouts of freezing fog, pelting snow, and freezing rain. 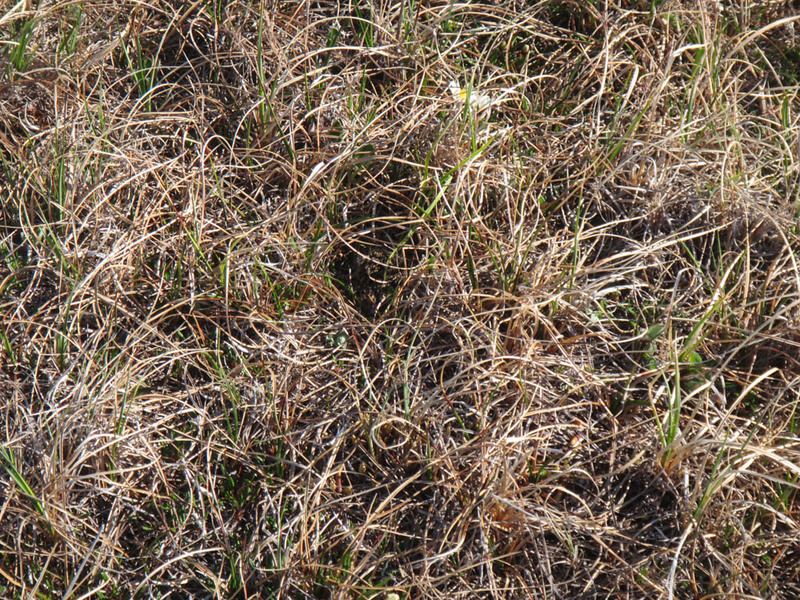 This is the longest consistent stretch of bad weather any of us can remember. 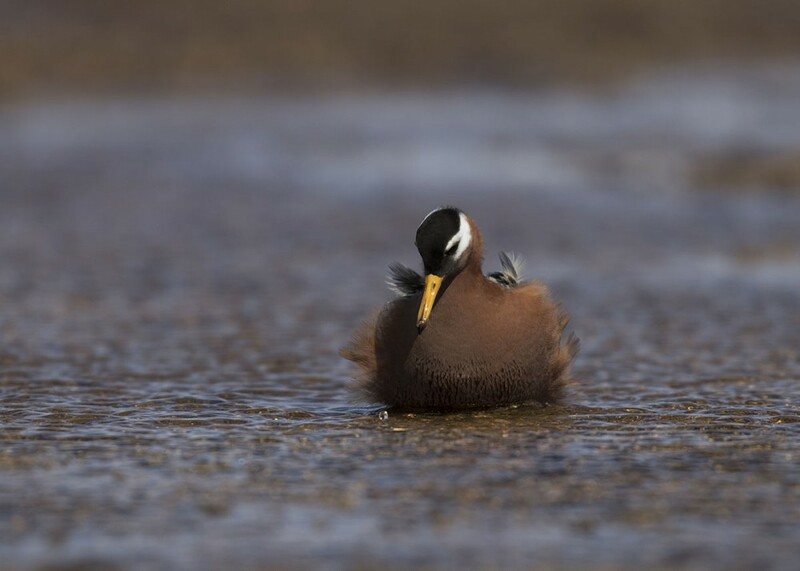 When the weather is this cold and windy shorebirds hunker down and often interrupt or wait to initiate laying their eggs. 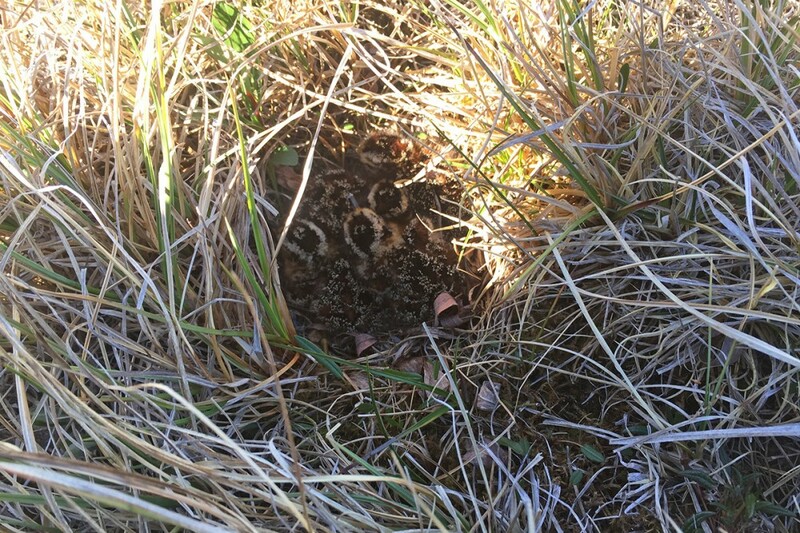 This makes it very difficult to find shorebird nests, or to do much banding. 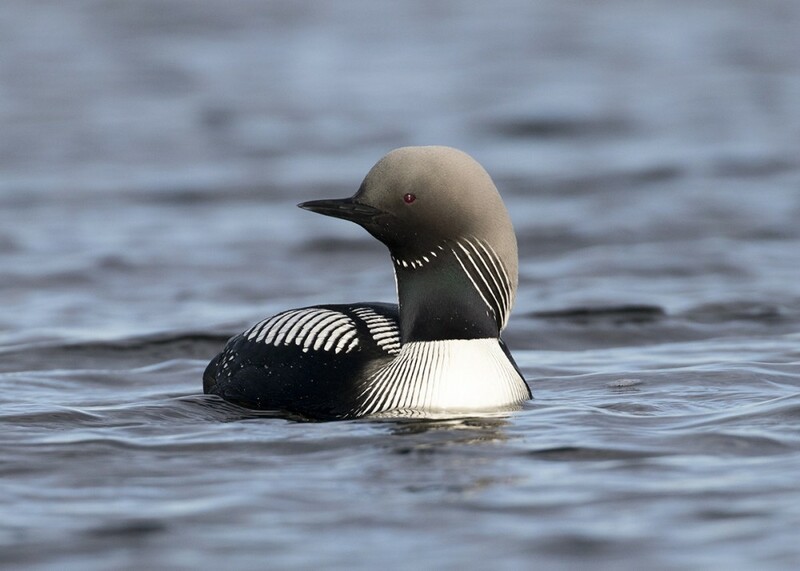 But in the rare patches of sunshine, the birds are in full glorious display. 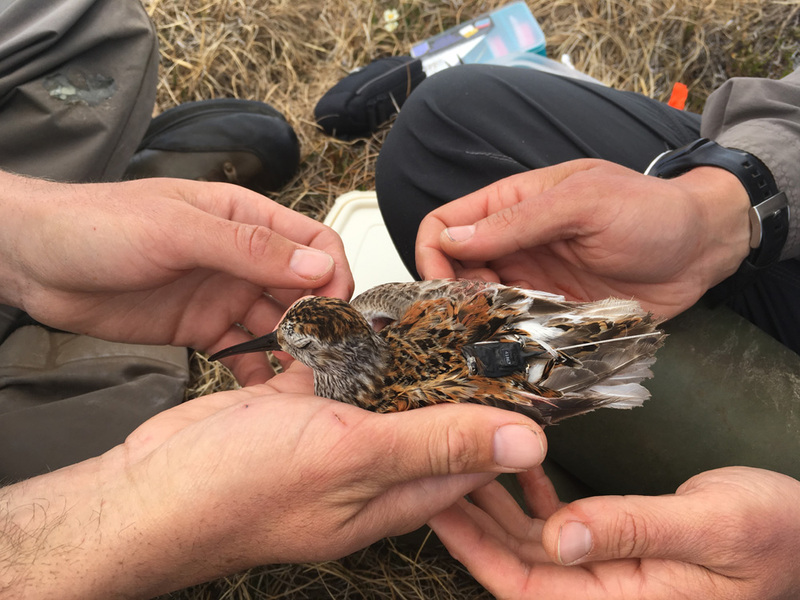 As a result of the weather, we have only 3 newly banded Dunlin equipped with a GPS tracker to date, but our crews have found 35 shorebird nests including Pectoral Sandpiper, Red Phalarope, American Golden-plover, Dunlin, and Semipalmated Sandpiper. 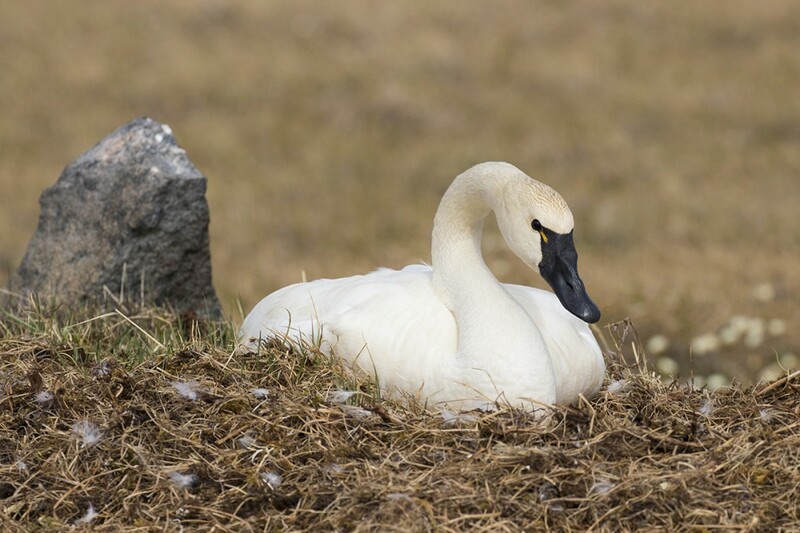 We also have 71 waterfowl nests of which 50 are Cackling Goose, as well as Tundra Swan, Greater White-fronted Goose, Black Brant, King Eider, Canada Goose, and Long-tailed Duck. 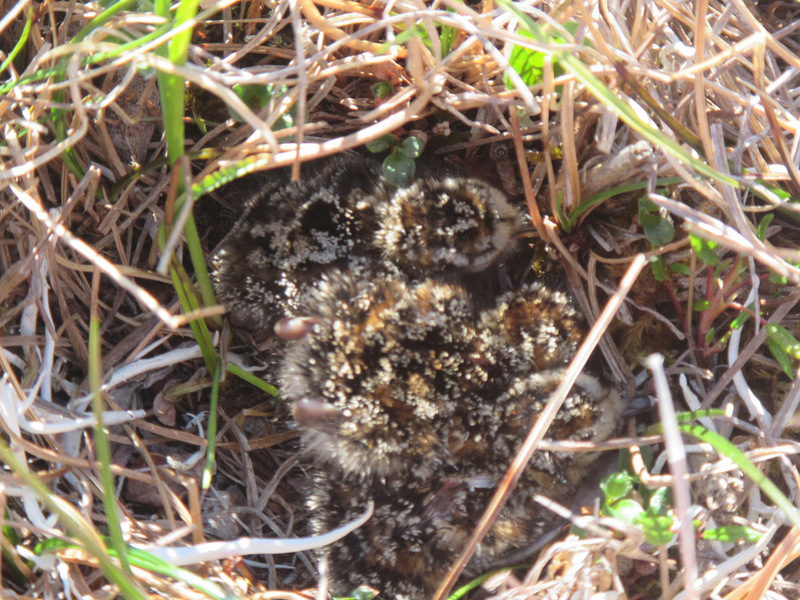 The remaining 28 nests include Lapland Longspur, Glaucous Gull, and Parasitic Jaeger. 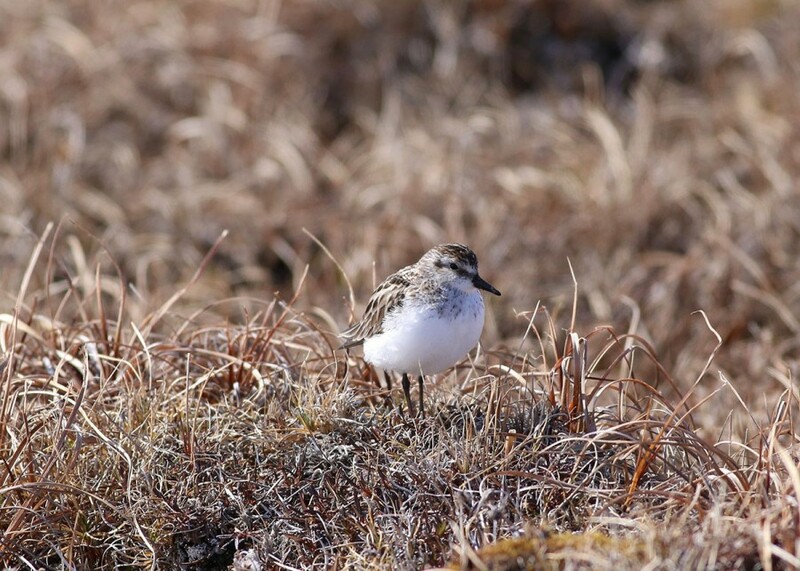 Weather forecasts predict less wind but temperatures remaining in the 30s, so it’s not clear when we will have weather good enough to deploy trackers on tiny Semipalmated Sandpipers. 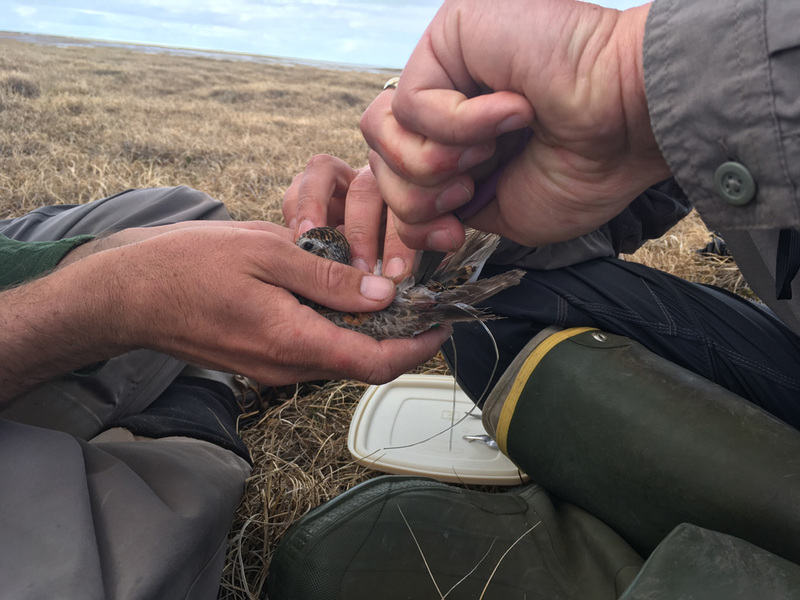 Our colleagues in Utqiavik (formerly Barrow) report a similarly late spring, and have not been able to deploy any GPS trackers yet. 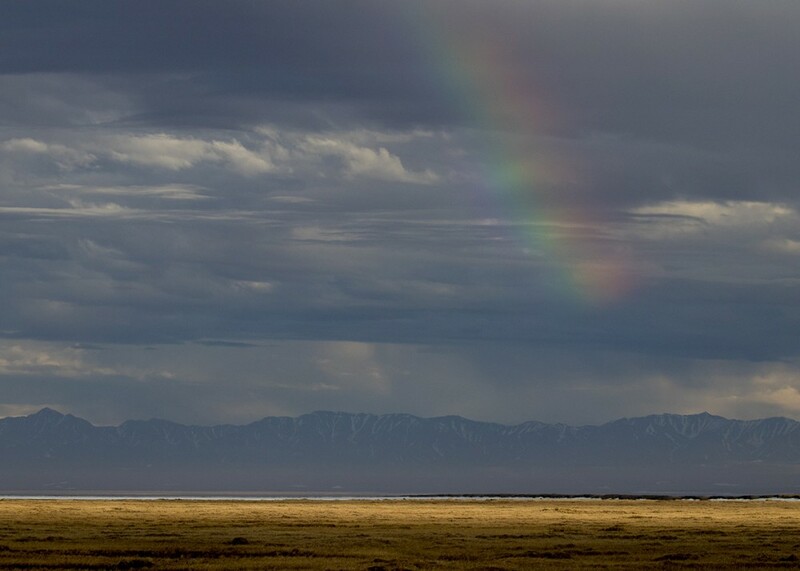 We have had a few breaks in the clouds and a couple of mostly sunny days that reveal inspiring views of the Brooks Range that lift our spirits. 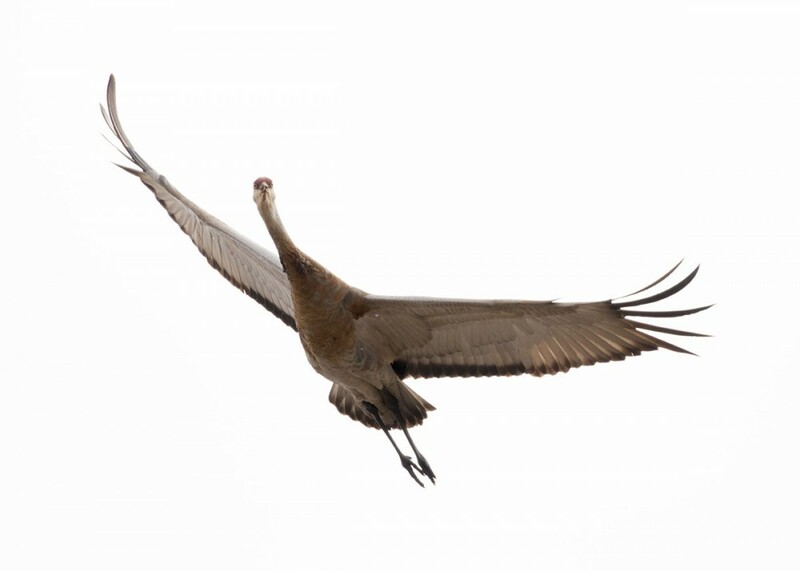 Even with fierce weather we have had some spectacular bird sightings as you’ll see in the photos below. 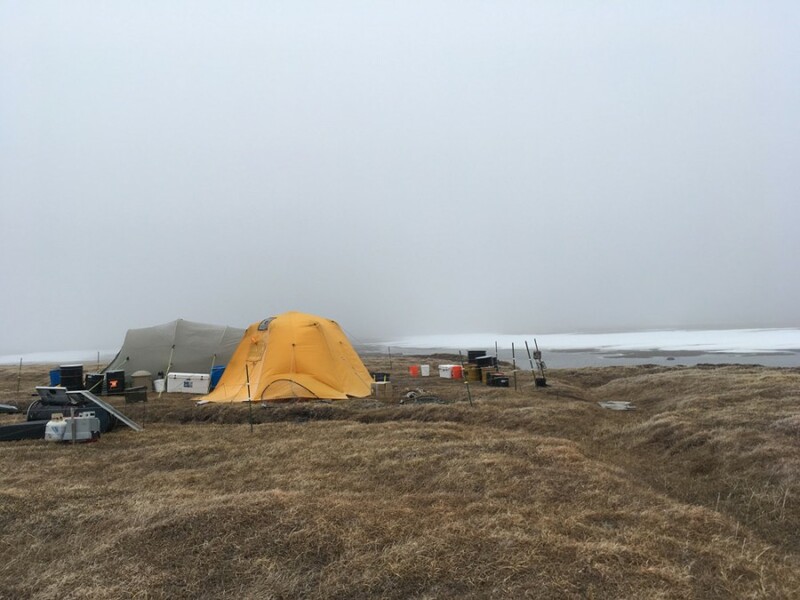 One side benefit to the rugged weather has been some extra time in camp to get the banding and lab gear organized and work out routines for managing samples and data. 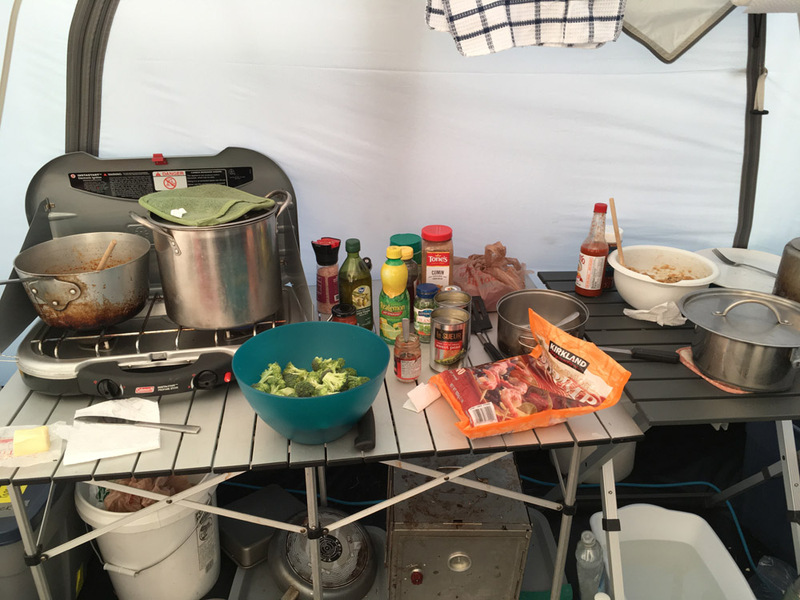 The consistent cold has also provided great refrigeration, and we’ve had time to cook hearty meals including homemade stews, chilis, curries, and pizza using a backpacker’s oven on top of the camp stove. So far we’ve seen very few mammals. 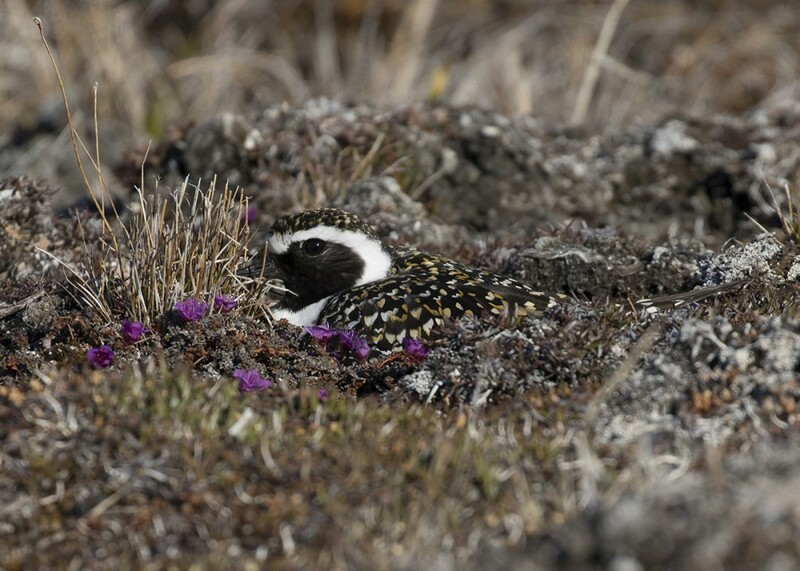 There have been occasional Caribou and Red Fox, including this one diligently hunting for eggs and lemmings. 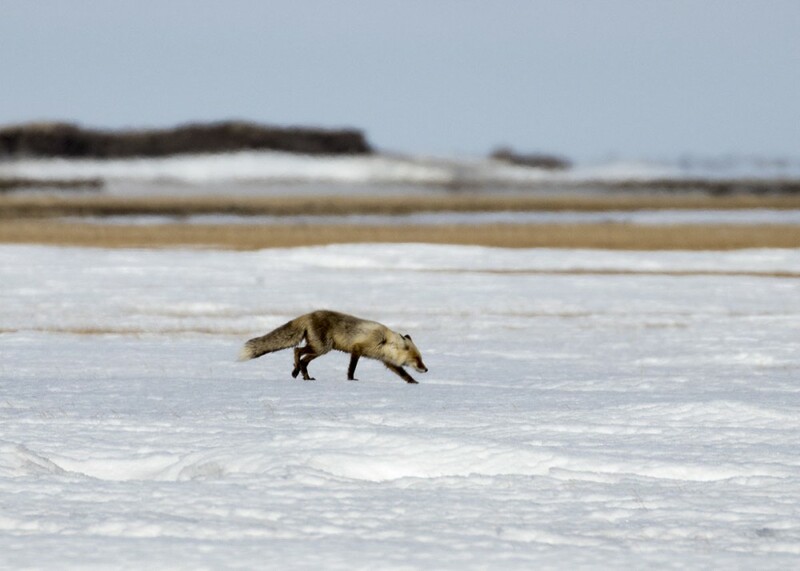 Although we’ve seen only one lemming so far, we have observed fox pounce on them through the snow so we know they are still in their burrows due to the late spring. 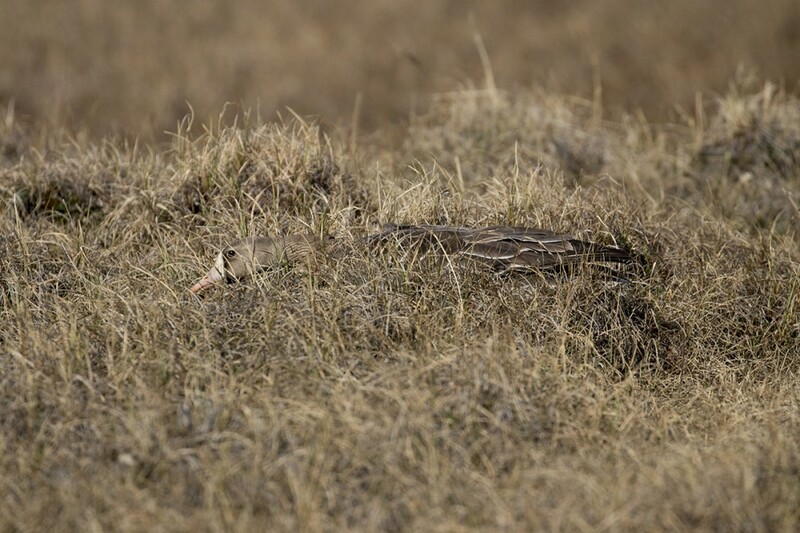 Fortunately we’ve seen no grizzly or polar bear yet, though there is clear evidence of grizzly digging ground squirrels out of the river bank next to our tents in the form of big holes and big scats! 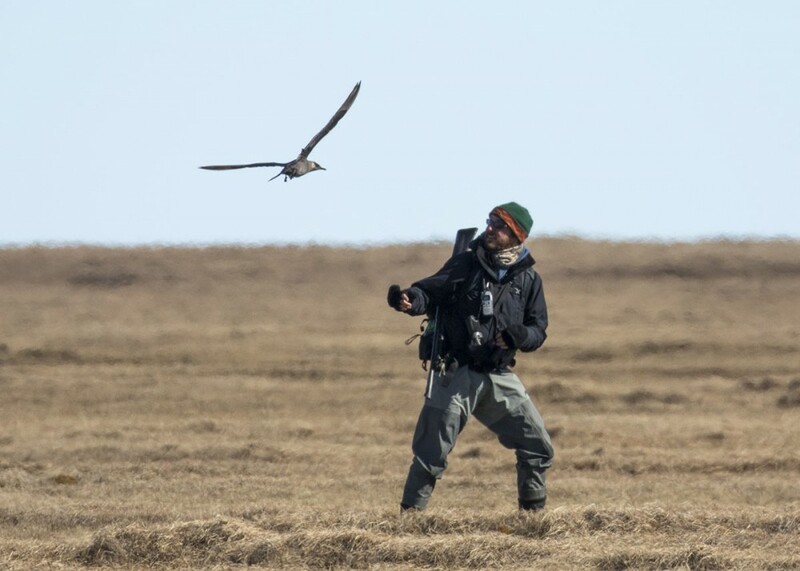 In the next post, Shiloh will introduce you to the crew and give you an update on nest searching and deploying trackers. 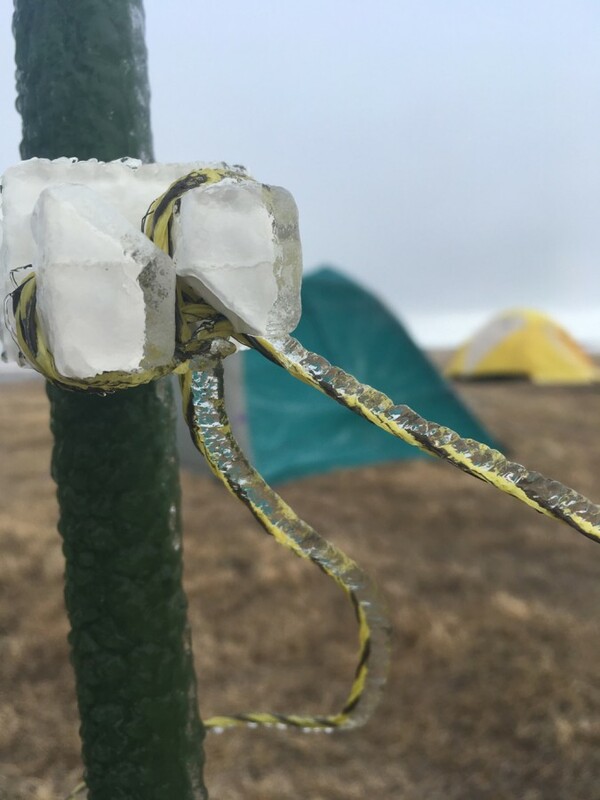 Now that we are safely on the ground and have gotten camp set up, we can collect our photos and stories from the hectic adventure that is launching an arctic expedition. 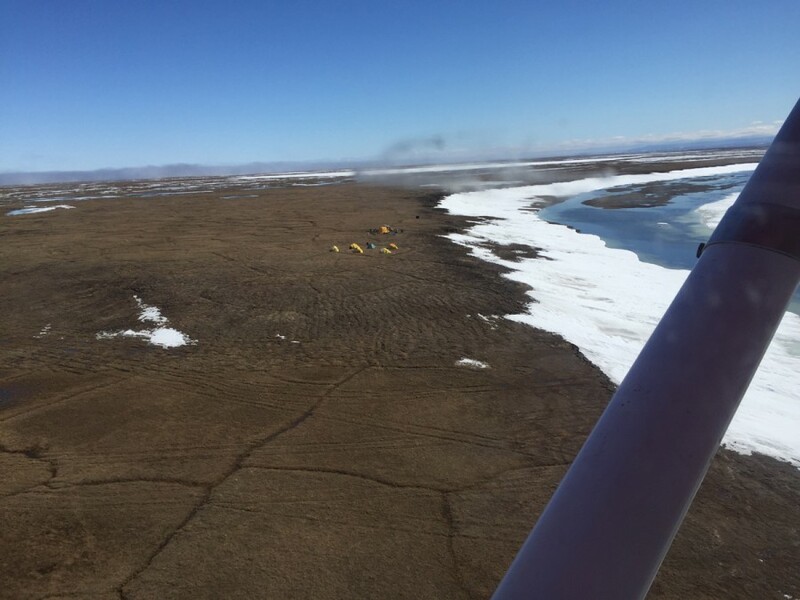 On May 31 we arrived in camp to two rare bright blue days, 38⁰ with a light south wind, and woke on 2 June to howling winds, fresh ice on the Staines Slough, a dusting of snow, and the camp water jugs frozen solid from temps in the low 20s. 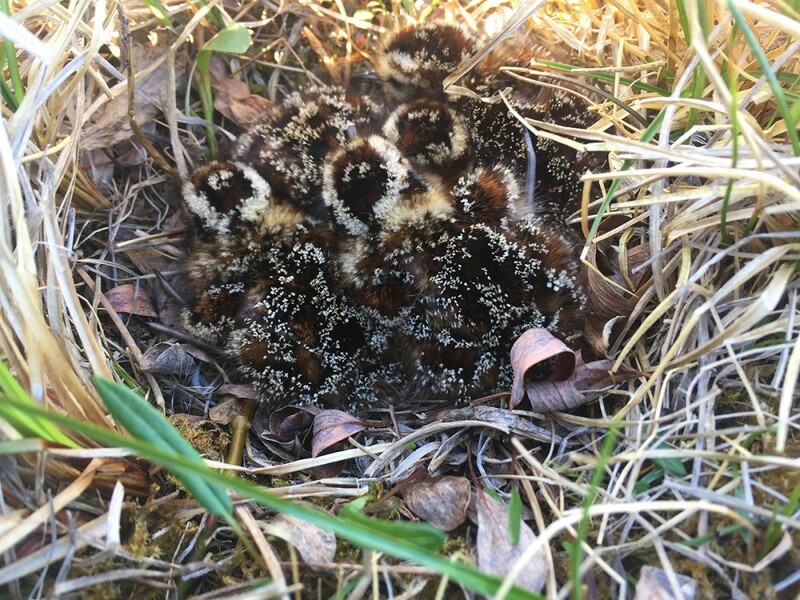 Welcome to winter, and Manomet’s 2017 arctic shorebird research field season! There’s a lot that leads up to this moment! 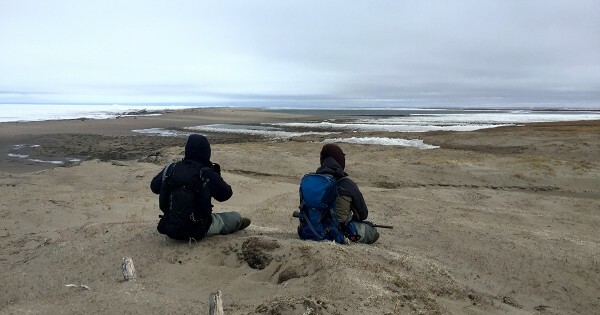 It always takes long months of preparation to launch a field camp in the arctic. 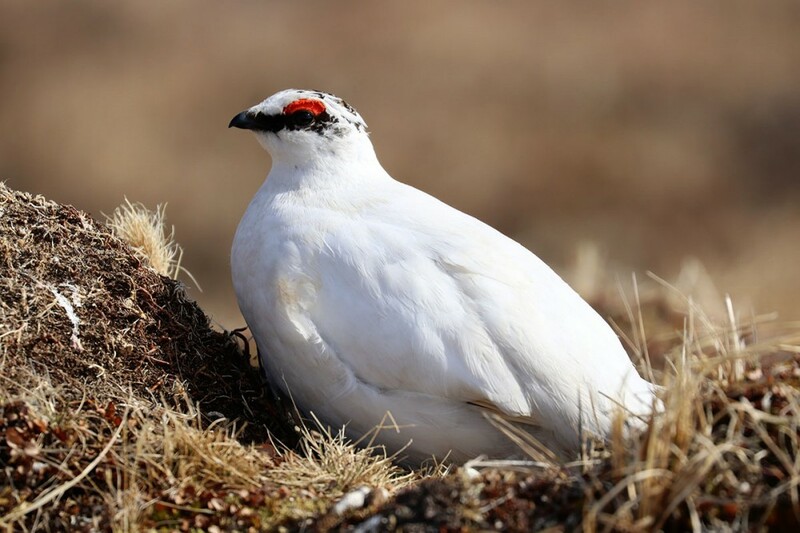 It begins with grant writing up to 2 years prior and the generosity of Manomet’s donors who contribute annually to our arctic research. 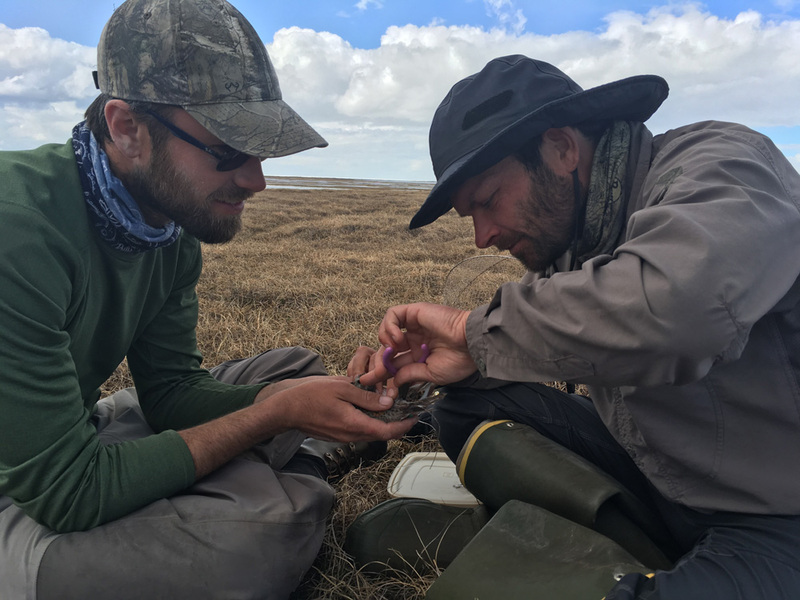 In December Stephen meets in Alaska with our partners to begin planning the field season, continuing with conference calls through the winter to revise the protocol, plan the hiring, and manage budgets. By March our crew is hired, and we begin ordering supplies and gear necessary for operating a remote field camp that runs mostly off solar. 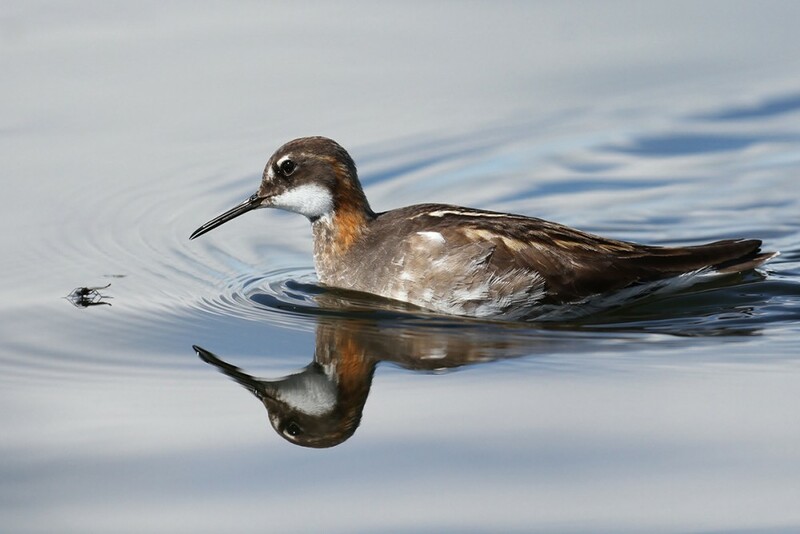 This year I (Metta) arrived 30 April and was joined in Fairbanks by Alex Lamoreaux, a superb birder from Hershey, PA known to many in the ebird community. 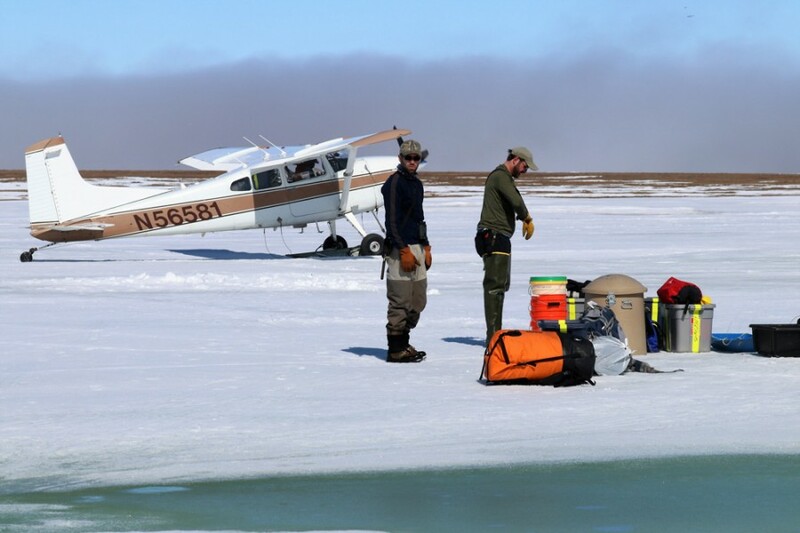 Together we invested nearly 8 weeks of work in the Fish and Wildlife warehouse identifying and testing gear, and purchasing necessary replacements and supplies to outfit the camp. We spent many hours updating a spreadsheet with more than 450 items, not including the grocery/kitchen/health list of more than 300 items, along with preparation of all of the data forms, maps, and GPS points! 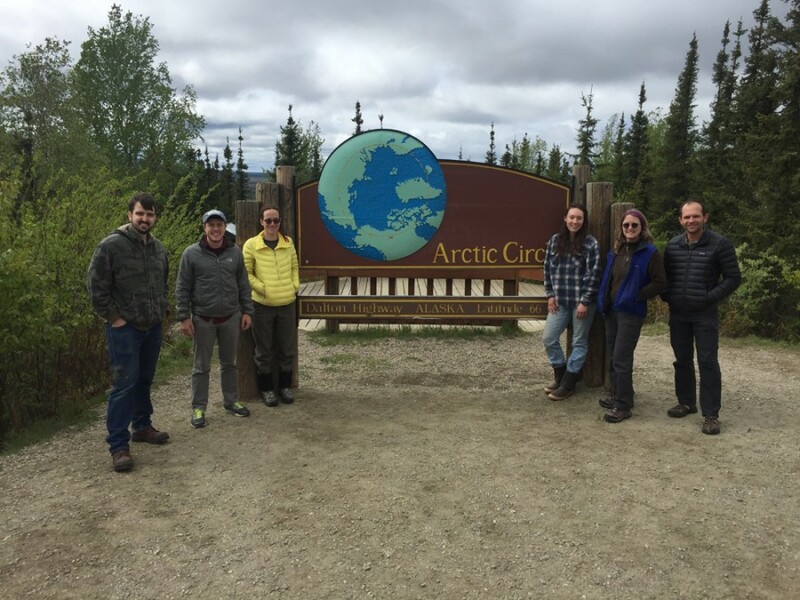 Shiloh Schulte and Alan Kneidel, both veterans of arctic field research, joined us in Anchorage on 24 May for 2 days of training with our colleague Rick Lanctot. 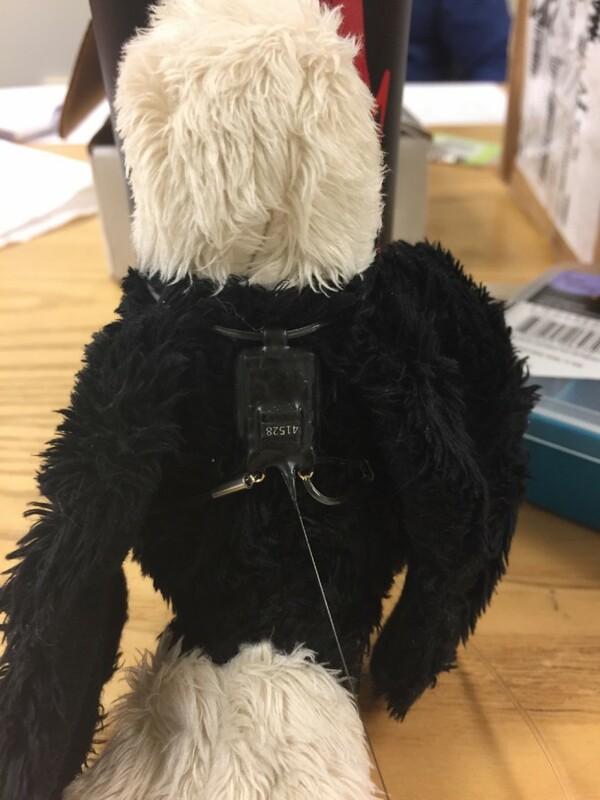 First, we practiced making the tiny harnesses for attaching GPS trackers to Semipalmated Sandpipers and Dunlin and attaching them to a toy stuffed eagle under the expert guidance of Lee Tibbitts. 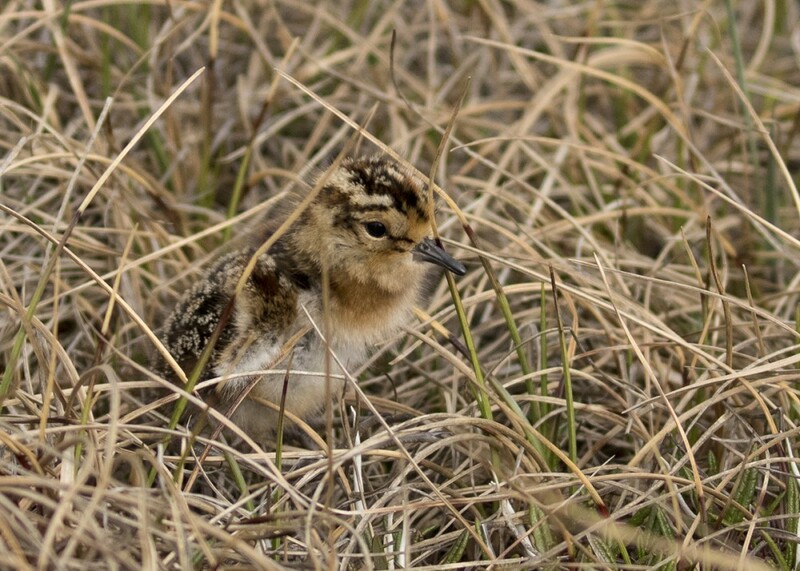 As Shiloh mentioned in the previous post, these devices will help us answer questions about when shorebirds arrive at and leave the coast, how much they move around before migration, and the specific habitat types they are using. 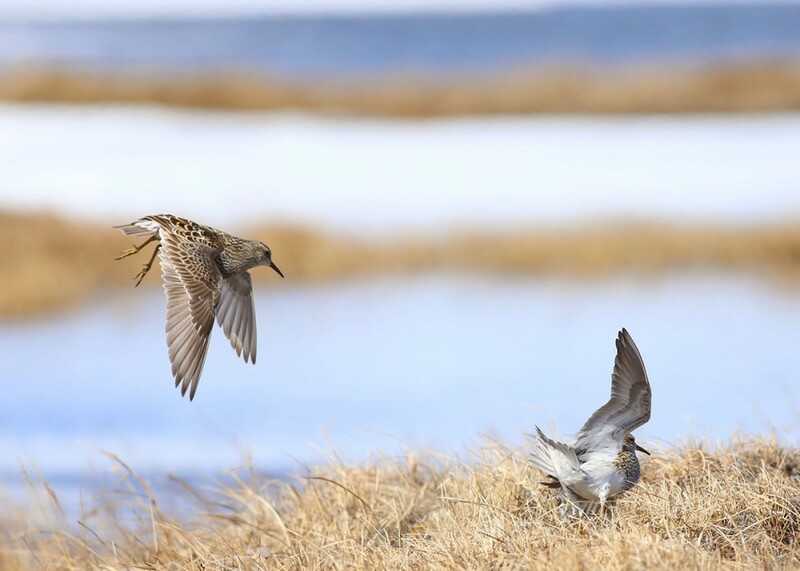 In turn, this will help us understand how changes caused by climate change and coastal development are affecting shorebirds on the Arctic Coast. 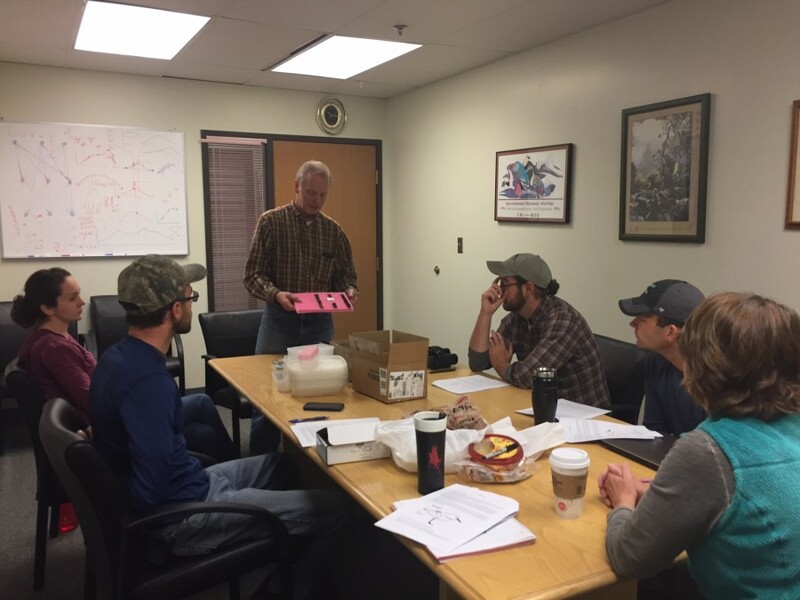 We completed bear safety training that afternoon, and firearms safety the next morning, and yes, there were tests afterwards and we all passed! 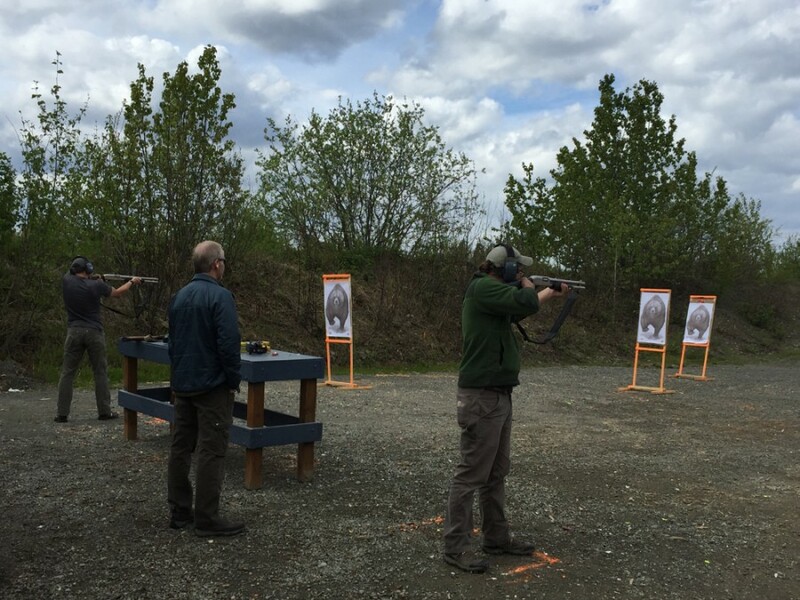 Later at the shooting range we all qualified to carry shotguns in the field as protection if needed should we have a life-threatening bear encounter. 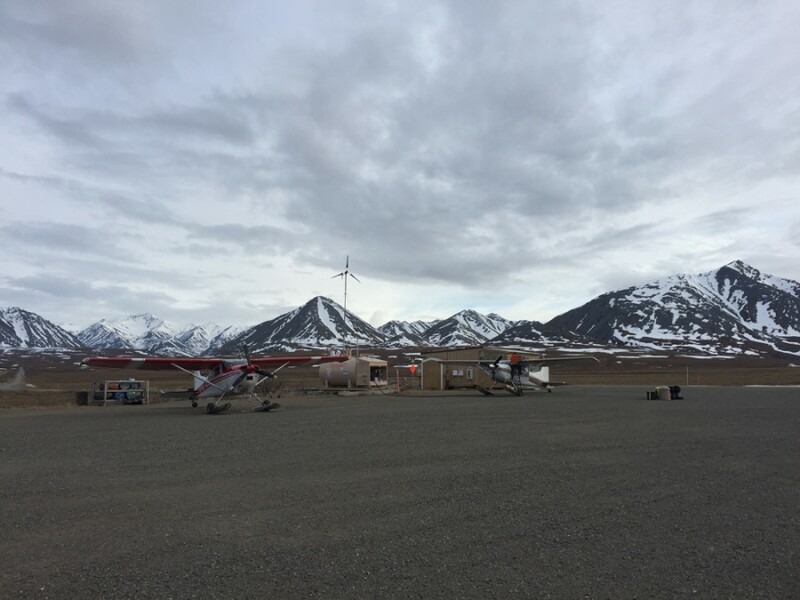 After two more hectic days of preparation and packing back in Fairbanks, the first 4 of our crew headed up to Galbraith Lake just north of the Brooks Range on 30 May in 2 huge pickup trucks with our gear, while 3 others stayed an extra night to be flown directly to camp from Fairbanks. 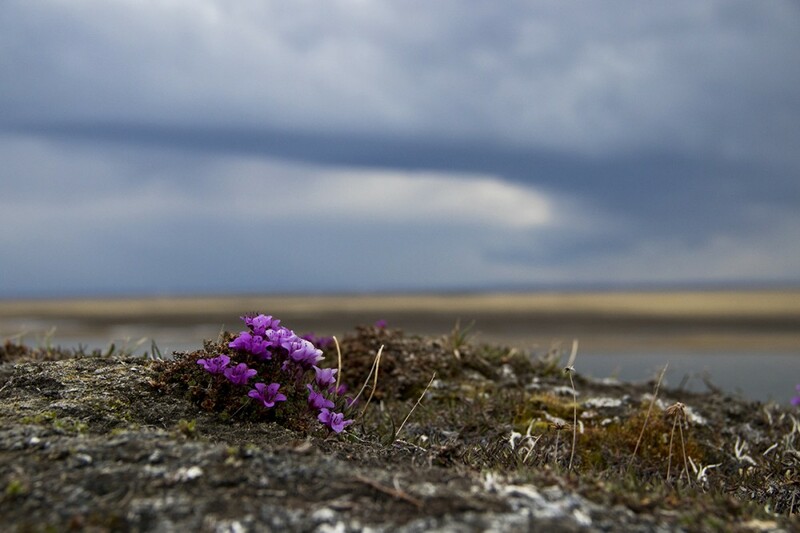 Those who drove in trucks had a lovely 10-hour drive up the Dalton Highway, including a stop crossing the Arctic Circle then on through the Brooks Range, the northernmost mountains in the world, and onto the tundra at last! 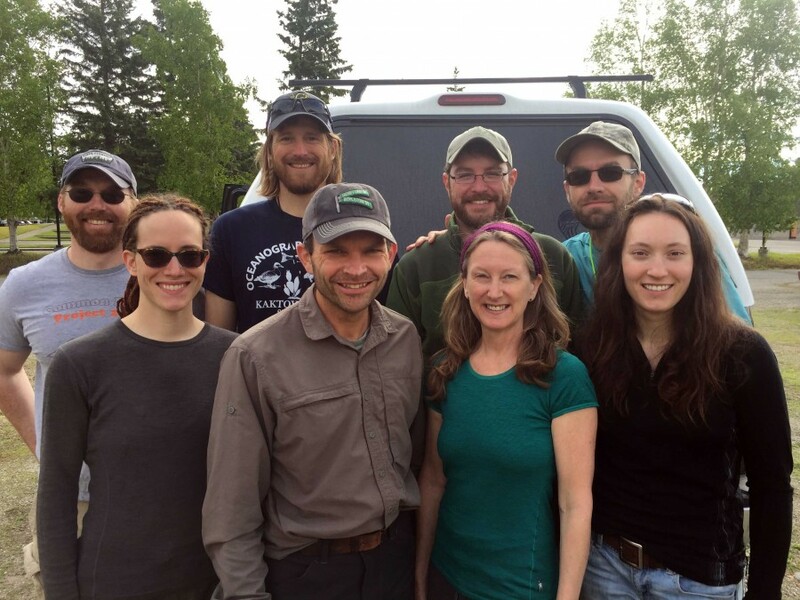 L to R: Alfredo Soto (Wildlife Specialist for the Arctic Refuge) and his friend Joe came with us to drive the trucks back to Fairbanks; plus Jessica, Elyssa, Metta, and Shiloh at the Arctic Circle. 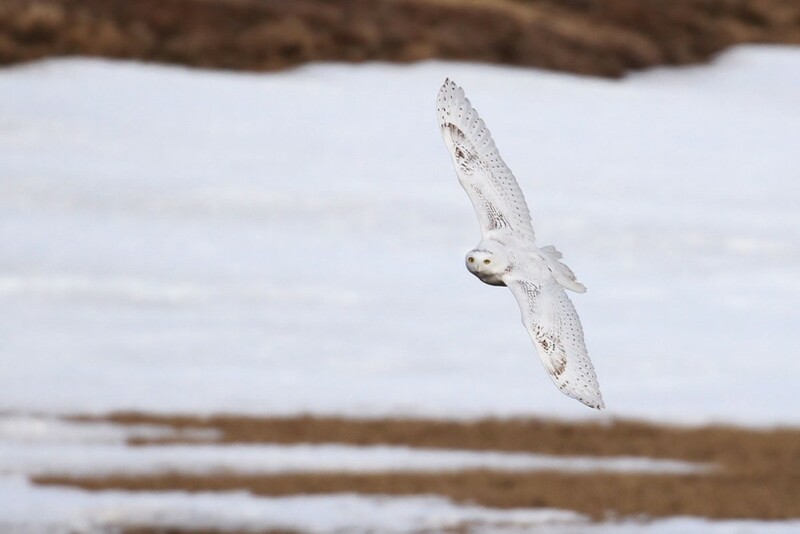 After a night in a small Fish & Wildlife Service cabin on a gravel airstrip at Galbraith Lake about 10 miles north of the mountains, the pilots began ferrying passengers and gear to camp, a 75-minute flight over several other rivers and the vast expanse of the Arctic tundra. 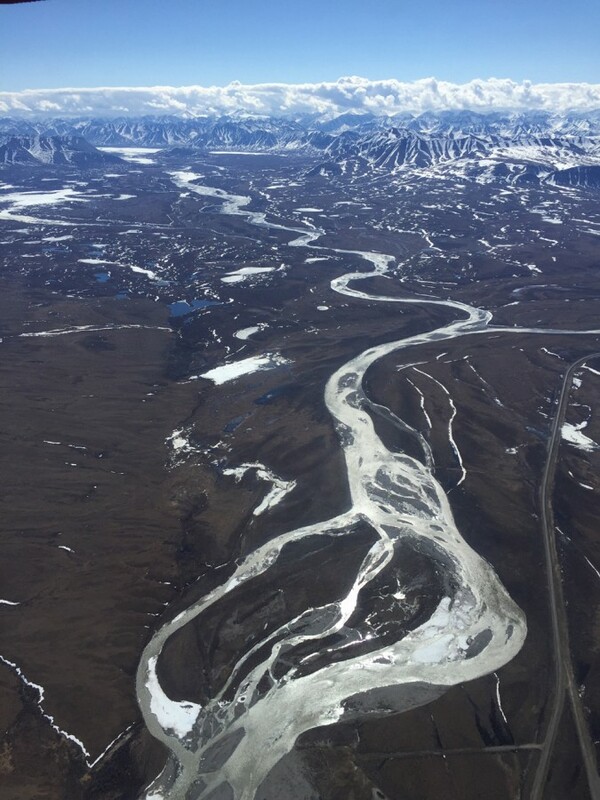 As we near our camp site about a mile from the ocean, the pilot’s GPS shows the expanse of the Canning River Delta on the Western boundary of the Arctic National Wildlife Refuge. The two Cessna 185s used by the U.S. 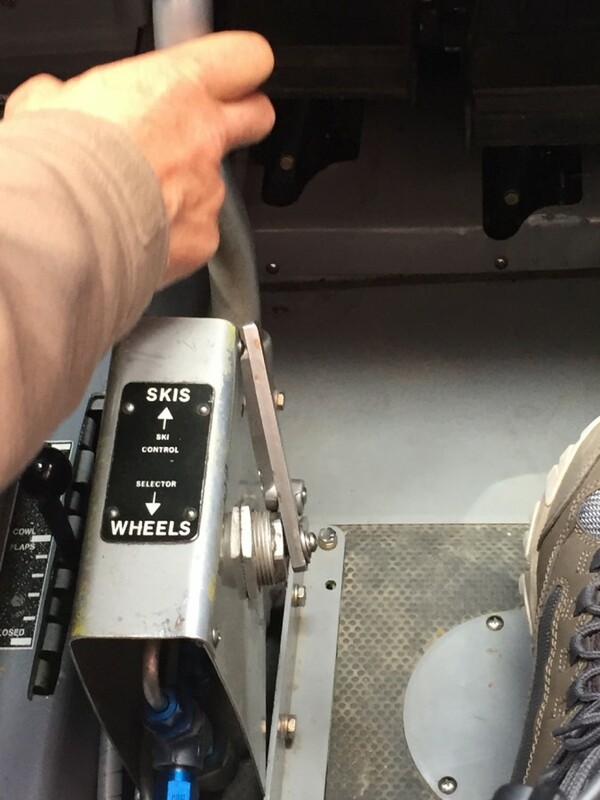 Fish & Wildlife Service pilots to bring us to camp are equipped with tundra tires and skis that can be lowered by lever for landing on a frozen lake. It’s important to make the right choice! 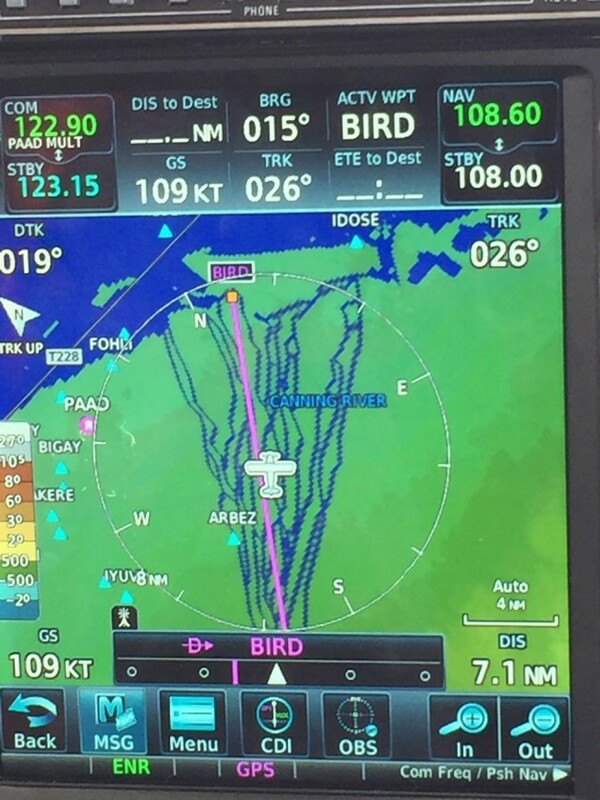 Finally we land! Now comes the hard part: all our gear has to be transported about ½ mile from the lake to camp using plastic sleds powered by… us! After many trips, much sweat, and some impressive bruises and sore muscles, we settle in for the long job of setting up camp. 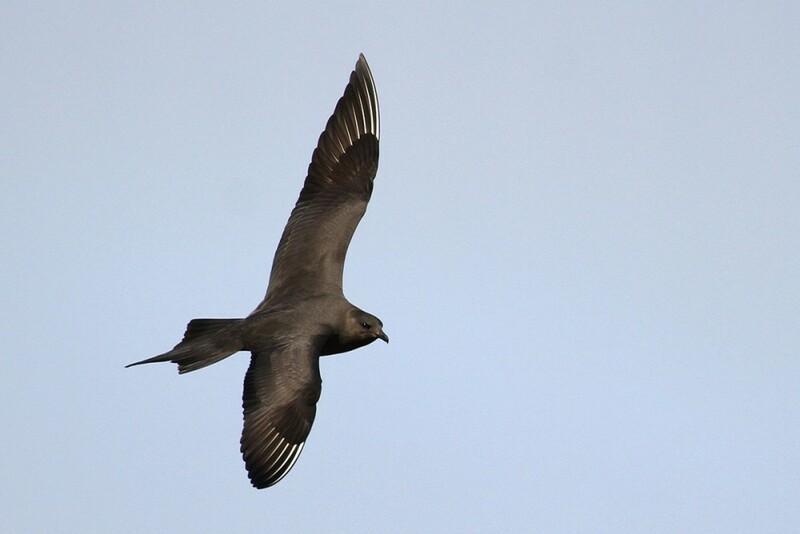 In our next post we will introduce you to the crew, and give an overview of our first week in the field.